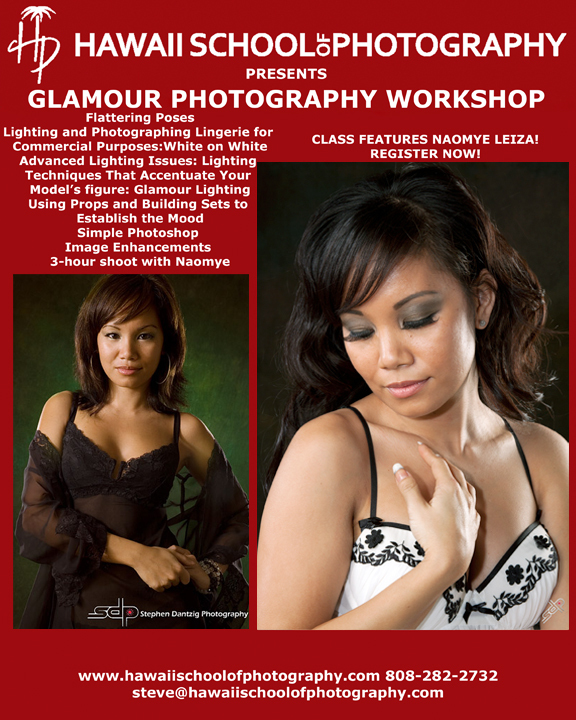 Glamour and Lingerie Lighting One specialty workshop is held every month from 9:00AM to 6:00PM in my studio on Nuuanu Avenue. NO CLASSES ARE HELD AT THE ALA WAI ADDRESS. Please click here to check our calendar for dates, availability and to register online. Tuition: Seminar: $255.00 Model Fees: $90.00 Total: $345.00 PLUS 4.712 GET (12% Kama’aina/Military and 17% Alumni discounts off the tuition portion are available for this class). 3-hour shoot with one of O’ahu’s top models. The lighting class was excellent! Great combination of an academic discussion regarding the qualities of light combined with several practical applications in the studio with a light meter and a model. Granted, I think it will be a while before my head stops hurting from the “F-stop math” involved in combining multiple light sources but you made it as painless, and as clear, as possible. All in all, great class, great atmosphere, and am looking forward to the next class!